Meri Soch aur Meri Pahechan, Dono hi teri aukaat se bahar hai. त्वचा में सौंदर्य और हड्डी में एटिट्यूड! ..
स्वागत नहीं करो गए आप हमारा ? जब स्टेटस कॉपी होने लग जाए तो समझ लो तरक्की कर रहे हो. फेंका जो पत्थर पानी में तो हलचल मच गई, निगाहें क्या मिली उनसे बस तबीयत ही खिल गई…!! 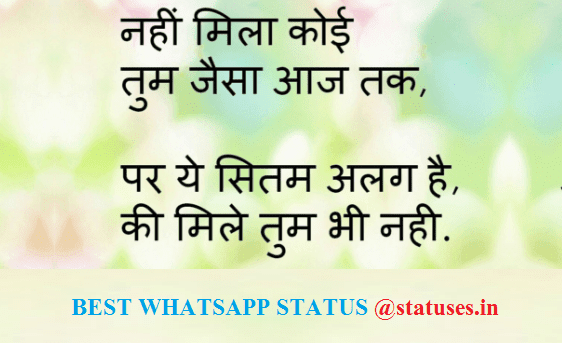 So how were these above written Best One Line Whatsapp Status in Hindi, have you enjoyed'em. I hope you have set them on your Whatsapp Status and posted on Facebook and tagged your friends too. If you haven't done it.. do it.. hehe.. Romantic Quotes, New Attitude Status. You can read our other collections from our homepage.